Designed for the Canon EOS M compact system camera, the Canon 11-22mm f4-5.6 IS STM Lens is a lightweight, ultra wide-angle lens with image stabilisation and is ideal for capturing dramatic landscapes and eye-grabbing architectural shots. 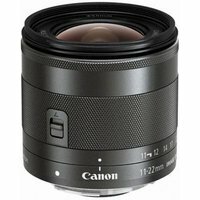 The Canon 11-22mm IS STM lens is lightweight, easily portable and features a neat, retractable design to ensure you have plenty of space left in your camera bag for other accessories. With Canon's STM (stepping motor technology) you can be reassured that movies are sharp with quite focusing and handling is easy and smooth. The image stabilisation technology (IS) reduces camera shake and delivers steady shots even when shooting handheld in low light. This lens includes two aspherical lenses, one UD lens and Super Spectra coatings to ensure your photos have plenty of contrast, the colour balance is accurate and flare and ghosting is reduced. This lens also offers a minimum focusing distance of 0.15m, making it great for detailed close-up work.